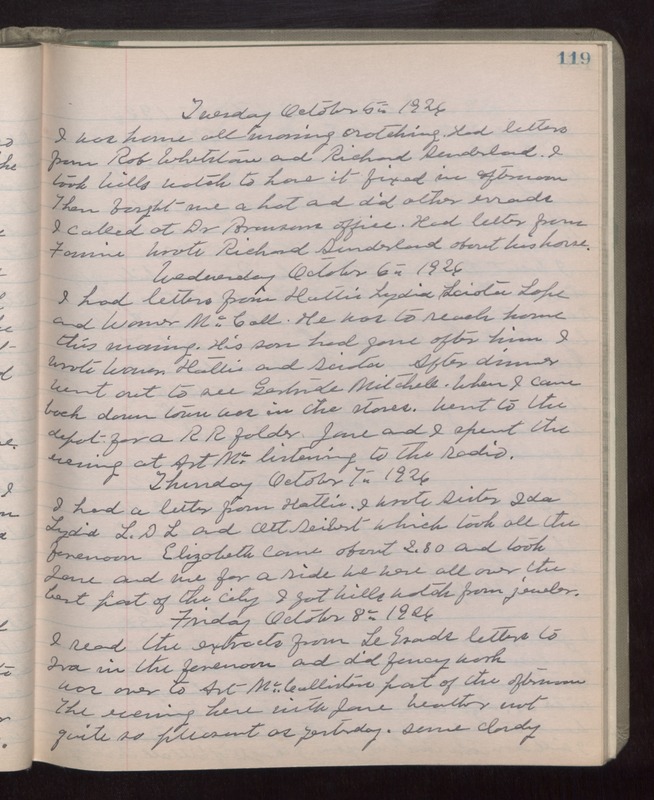 Tuesday October 5th 1926 I was home all morning crotcheting. Had letters from Rob Whetstone and Richard Sunderland. I took Wills watch to have it fixed in afternoon. Then bought me a hat and did other errands. I called at Dr Bronsons office. Had letter from Fannie. Wrote Richard Sunderland about his house. Wednesday October 6th 1926 I had letters from Hattie, Lydia, Sciota Lape, and Warner McCall. he was to reach home this morning. His son had gone after him. I wrote Warner, Hattie and Sciota. After dinner went out to see Gertrude Mitchell. When I came back down town was in the stores. Went to the depot for a RR folder. Jane and I spent the evening at Art Mc--- listening to the radio. Thursday October 7th 1926 I had a letter from Hattie. I wrote sister Ida, Lydia, L D L and Ott Seibertt which took all the forenoon. Elizabeth came about 2.30 and took Jane and me for a ride. We were all over the best part of the city. I got Wills watch from jeweler. Friday October 8th 1926 I read the extracts from LeGrands letters to Iva in the forenoon and did fancy work. Was over to Art McCallisters part of the afternoon. The evening here with Jane. Weather not quite so pleasant as yesterday. Some cloudy.